Construction, sand, trucks, fumes, industrial – Al Quoz. 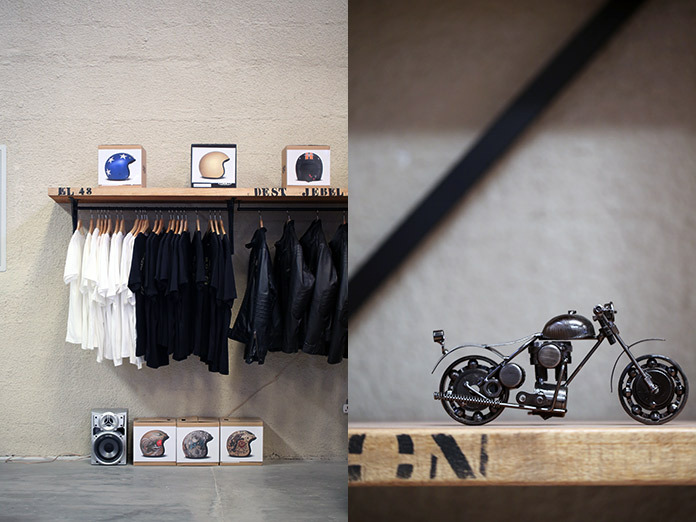 Minimal, serene, cool, that jazz type of cool – Café Rider. The espresso. The kind of bitter that’s sweet. The kind of brown that’s rich. And the kind of aroma that makes you smile and nod. Do I have a croissant? No. I don’t want to. Keeping it just motor bikes and coffee is fine by me. The clientele, not your typical bearded and patched up jeans that you would think, but more of a sophisticated rider. The one that loves beautiful lines and curves and nothing more than the freedom of a ride. A handful of bikes, mistresses, on display down the middle of the space, posing. I know nothing about bikes, but I can always appreciate beauty in all its forms. Custom your own starting at a cool 90 grand. Will I make my own bike? No. Will I buy a helmet? No. Will I return? On trend with the rise of independent concepts, Café Rider, is a creative space that aims to bring people together who share the same passion – lovely. The owner, a banker who craves to share and express his passion, how can I not relate to that.